March 22, 2013, 1:15 p.m.
A news ecosystem poised for growth has some fundamental questions to figure out — financial, legal, and journalistic. By Sam Petulla @spetulla March 22, 2013, 1:15 p.m.
For the last 50 years, Myanmar’s journalists have fled to the Thai and Indian borders, where they provided some of the only insights available to anyone — Burmese inside the country and outside observers alike — into the brutal actions of their government. Some were driven outward in patterns flowing from their ethnic belongings: the Kachin, Shan, and Karen went east and southeast into Thailand. Supporters of the pro-democracy movement fled to Thailand or Europe, where they sent radio and TV signals and print media back home to Burma. The casual observer of the Myanmar of today can almost be forgiven for failing to notice that past. Following two heralded reform elections and a two-year period of economic opening, today Yangon sprawls with development projects and capitalistic fervor amid its decaying British-colonial buildings. Busy consultants advise Fortune 500 clients about a “greenfield” country, with over 90 percent of its 60 million people lacking mobile phones, Internet service, or bank accounts. That same tide of growth sweeping the country is affecting the media business just as much as everyone else. Those in exile find themselves gauging return to the country that hunted them only a few years ago while weighing real business decisions in anticipation of the tens of millions of Burmese expected to be newly-wired with phones with Internet connections by 2015. Existing Burmese private media plan their own expansions. Both are caught in an exaggeration of the U.S. media’s situation — needing to firmly keep one foot in the past to survive while aiming forward into a digital frontier that barely even exists yet. Consider Kyaw Zaw Moe, the English editor of The Irrawaddy, one of the most popular Burmese exile media websites. For 10 years, as a result of his involvement in political agitation following protests in 1988, he remained imprisoned in the notorious Insein Prison. When he was released, he fled Myanmar and joined his brother Aung Zaw, The Irrawaddy’s founder, in Thailand. Recently, these are some of the question occupying his thoughts: how to find office space, which has become prohibitively expensive in Yangon; how to find advertisers without connections to a blacklisted individual that could spell ruin for him; how best to interact with his Facebook readership, which is growing at an extremely fast clip; and how to budget for mobile at the same time. This is no longer the Myanmar he knew just a few years ago. But first, his priority is print. “You can make a lot of money out of it,” says Kyaw Zaw Moe. Indeed, media companies are preparing for a new moment in Myanmar publishing — the “daily era,” as it’s being called. Beginning April 1, newspapers — called “journals” in Myanmar, and until now published weekly in large, bound format — will be able to publish daily under a less stringent censorship regime than ruled in the past. Thaung Su Nyein, the CEO of Information Matrix, which publishes several of Myanmar’s highest-circulation weekly journals, said he expects daily circulation to reach that of the weeklies within a year, but that it will take some time for revenue to catch up. He says it could take three years to turn a profit, and other publications quoted similar timeframes. News organizations are also in a struggle to find reporters. An editor at The Myanmar Times, another of the leading publications, explained to me that because Myanmar has lacked a press culture built around storytelling and probing reporting, there’s a lack of available talent. 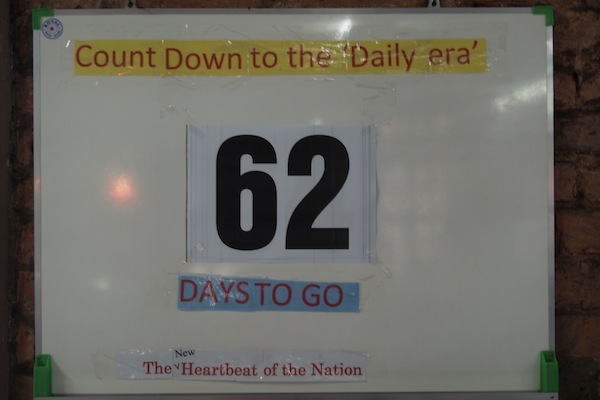 A countdown on display in the lobby of The Myanmar Times, photographed earlier this year, for its expected launch as a daily publication. Exile publishers trying to come home have additional burdens. Aung Zaw had to eat the full costs of a first edition the Irrawaddy published a few months ago. He does not yet know the specifics about readership and distribution advertisers demand, so for now, the publication is ad-free. On top of that, because nearly every sector of industry has someone connected to someone on an international financial blacklist, a “crony,” those reliant on international donations are in a bind. Aung Zaw hesitates out of concern that if he goes into business with the wrong person, he will lose support from an organization such as the National Endowment for Democracy, an organization funded by the American government that blunt in the past about the strings attached to its support. The Democratic Voice of Burma, a TV and radio broadcaster originally founded with aid from the Norwegian government, is in a similar situation. 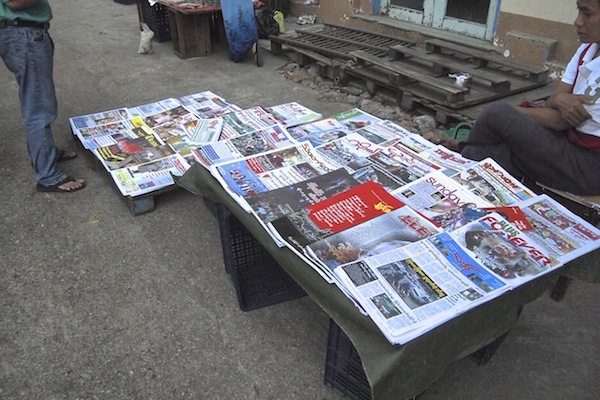 Print journals are still found handily at just about any street corner in downtown Yangon. In this way, far from heralding the arrival of “the end of censorship” and a new golden era of Burmese press, the move to daily is but one juncture in a larger set of transitions defining the new state of media in Myanmar. Even with its remarkable turnabout in the last few years, the country is still finding its way. The greater change happening in Myanmar media is not that different from other countries to have undergone political transition. Limited not by unpaved roads or poor Internet infrastructure, mobile is how most people access the Internet, and social media has taken off at a furious pace to become where consumers and media focus their attention. In Yangon and Mandalay, cell phone use has increased dramatically in the last year, and youth and adults for the most part can get online. With the highest weekly circulation numbers less than a few hundred thousand, already Facebook likes exceed subscriptions. Realizing the fact, weekly journals subverted the weekly prohibition by updating their social media pages and websites not just daily but throughout the day. And exile media posted free of the censorship laws. There is no question that daily newspapers will intensify the media as a civic institution But with Myanmar’s demographics and poor infrastructure, it will be mobile and the Internet’s mass expansion — with penetration rates expected to increase 900 percent in the next two years to 80 percent of the population— that will create the most dramatic changes, as suddenly millions of ethnic and disenfranchised groups outside the major cities will more readily coordinate and communicate their concerns with the cities. The development of a diverse and all-inclusive online ecosystem, only budding now in Myanmar, is seen as the point when the new media laws will be tested hardest. And already, media companies are preparing. Organizations say they have a few ideas ready to go to court new mobile users, like an SMS-based news system and expansion to an existing dial-in news service. With the call service, you dial a number to hear a short series of the day’s news recordings — almost like radio. Services such as these are seen as ways to attract readers, rural or urban, who may be outside print distribution or want to be on a different pricing plan. Another system many mentioned wanting to eventually have is a way to aggregate text messages to create some kind of interactivity with the audience. “We need to not just have one-way connection,” says Aye Chan Naing, editor-in-chief of the Democratic Voice of Burma. One way organizations may create those channels is by partnering with handset makers. In January, after HTC launched the first smartphone with native Burmese-language support, exile media companies sought the company out for a partnership. They’ve also approached Huawei and Samsung. The idea is to make it so that new phones come arrive pre-installed with a “reader” service to access their news and interact with their social media presences. The difference between such a system and Myanmar media today could not be more vast. Exile media operate cross-border, and text messaging is quite expensive. Apps are still a subject of debate: “We would never do something like an app,” says the Irrawaddy’s Kyaw Zaw Moe, pointing to the fact that the Google Play store is blocked and iOS 6 does not have native Burmese-language support, rendering it an inhospitable development environment. But those I have spoken to inside Google say that change to that system is on the way. [Update: Unblocked as of today.] And even so, other publications stressed that apps are absolutely on the horizon. But for quite some time, the small rebellions by Burmese media to adapt to the cracks in the government’s information blockade will continue to be paramount. A part of the Burmese press’s history, strategic experimentation has roots in exile media, which tested different paper sizes and print layouts to enable a quick paper fold during a search. Trends for Facebook are particularly impressive. The Myanmar Times receives has over 73,000 likes on its Facebook page despite receiving only 12,000 unique visitors to its website per month. Facebook is also used by ministry leaders, who gather subscribers and browse news story threads to see instant feedback from the citizenry into reforms. A last issue is that while expansion is certainly on the minds of exile and domestic groups alike, just as much — if not even more so — is the fact that the Myanmar media environment is extremely competitive and clubby. A number of “cronies” with verticalized business monopolies and deep connections in government run media businesses. The competition is certain to be fierce, and some say the current environment, in which dozens of print journals exist, may whittle down to four or five in a few years as readership consolidates. Just in my short time visiting The Myanmar Times, one of the more independent publications, I witnessed an ownership fight within the newsroom that escalated into a physical confrontation and 30-minutes of door-slamming and shouting. I was told that if I took photos, I would likely be escorted from the building. A few days later, I learned six charges had been filed. The dispute stemmed from complications from one editor’s politicized imprisonment several years ago, as well as earlier media laws. It’s impossible not to be overwhelmed in Yangon, though, by whatever you experience. At any moment, not far from wherever you stand, rebels fighters seeking territorial independence clash with the military, international telco executives court ministries, and exile media groups guide the process towards a new media law. All anyone knows now is one way or another, Myanmar’s next story will come from whatever results. Top photo of monk reading newspaper by Chris Beckett used under a Creative Commons license. Other photos by Sam Petulla. POSTED March 22, 2013, 1:15 p.m.
Petulla, Sam. "In Burma, newspapers are going daily, but the transformation to watch may be in mobile." Nieman Journalism Lab. Nieman Foundation for Journalism at Harvard, 22 Mar. 2013. Web. 19 Apr. 2019. Petulla, Sam. 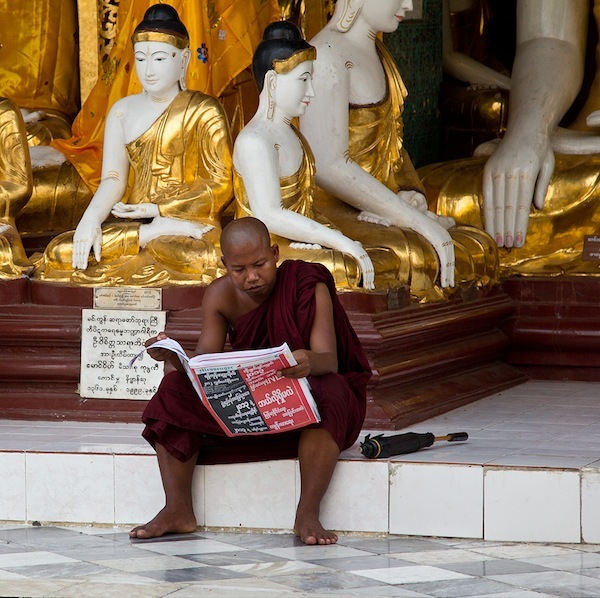 "In Burma, newspapers are going daily, but the transformation to watch may be in mobile." Nieman Journalism Lab. Last modified March 22, 2013. Accessed April 19, 2019. https://www.niemanlab.org/2013/03/in-burma-newspapers-are-going-daily-but-the-transformation-to-watch-may-be-in-mobile/.